Rose is a new face on the street. The unpacking is done and it’s now time to start living, but, as is the way with children moving to unknown places, the loneliness is palpable. Rose copes by making a wish. She doesn’t even know what she’s wishing for, yet she wishes with all her might, on starlight, star bright. The wish doesn’t come. Rose tries calling but her wish thing has no name—at least none that she yet knows. Things feel sad. Meanwhile, on the other side of somewhere else, a raggedy little bunny-like creature hops into a box and travels the oceans on the whiff of that heartfelt call, ceaselessly, never stopping, until it reaches the shore where Rose awaits. And the two connect. The loneliness eases … and very soon, young Rose finds another friend called Emm who perhaps, too, has been lonely, and who also may have put out the call for her little cat-like wish creature. Together they wander off to start their long lost friendship, with their wish animals tucked into the hoods of their coats. This is a tender, heartfelt story with an abstract narrative and whimsical, magical realism illustrations that have that Shaun Tan-esque strangeness children are so drawn to. There is much love and warmth and sadness to be found in the sketchlike images of Rose, her intensely loving family and her new friends. I particularly adore the toy shop scene towards the start of the book where Rose searches but fails to find her wish. 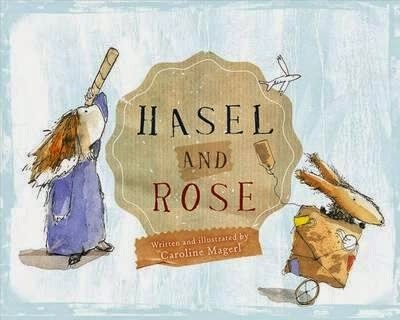 A sweet story of friendship and longing, with beautifully-penned text and concepts that will stay with the reader long after the last page has turned.